The Farmer’s Market usually inspires me to try new recipes or spend a little extra time in the kitchen. But some nights, I need a meal that is fast, easy, healthy and inexpensive. It’s nice to know that I can find the ingredients for those types of meals at the Farmer’s Market. I added 2 Wild Alaskan Sockeye Salmon fillets (from Costco’s 3lb bag) and one lemon to my “market basket” and ended up with all the ingredients needed for a quick meal. The meal took 35 minutes to prepare, cost $4.25 per serving for 4 nice size dinner portions, and resulted in very few dirty dishes. Now that’s a perfect quick meal. 1) Heat oven to 400 degrees. Place a few spinach leaves on a large piece of aluminum foil, then top with salmon fillets in a single layer. Generously season with salt and pepper, add thin slices of lemon and a drizzle of olive oil . Fully enclose salmon in foil and bake 18-20 minutes in oven, until cooked through. This technique is “en papillote”. To read more about en papillotte, and to get really hungry, read this article from the NY Times. The nice thing about en papillote is that it keeps the fish moist and flavorful AND there is no messy pan. What more could a busy gal want? 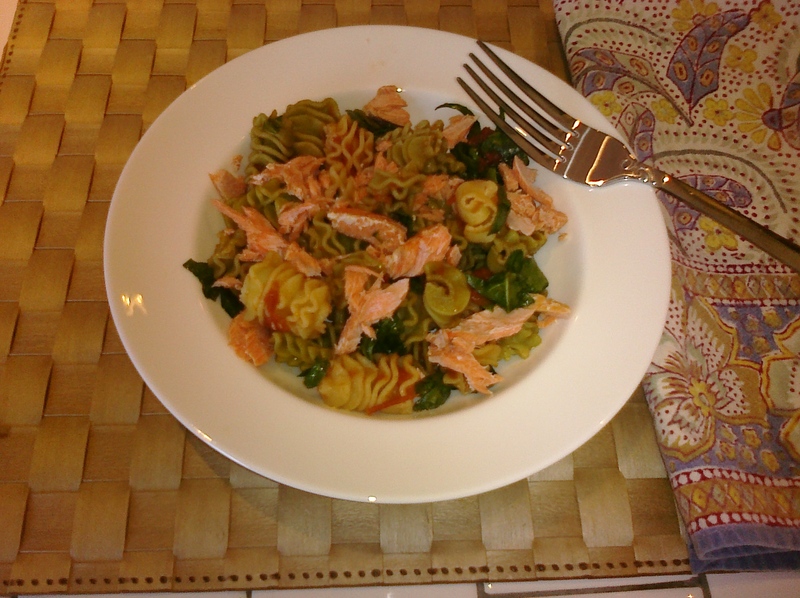 4) When the salmon is just out of the oven, add the pasta to the boiling water. Fresh pasta cooks in 2-3 minutes. 5) Drain pasta and immediately return to the pot. Add sauce and spinach. The sauce and spinach will warm and wilt slightly from the heat of the pasta. 6) Divide pasta in to 4 bowls, flake salmon on top. Serve. Your recipe sounds quick, delicious and healthy!